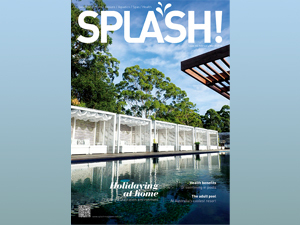 Click here to read the digital version of SPLASH! 109. Or click on the topic below to go straight to the story of interest. 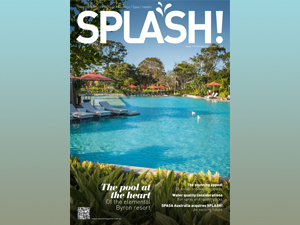 It includes recent developments on natural pools, new ideas for hydrotherapy and a couple of stories on Australian manufacturing, as well as plenty of other informative features, great products and latest news. 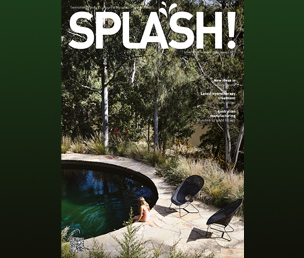 Recent developments in natural biological pools in Australia have led to their greater acceptance and an easier experience for both consumers and builders. 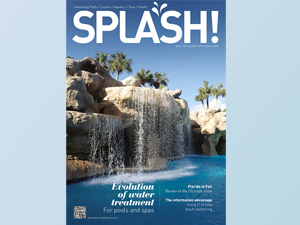 Alan Lewis looks at the new aquatic therapy of AquaStretch, and sees how it is helping people with chronic pain in several countries. AstralPool Australia has opened the world’s fourth largest swimming pool equipment factory in Melbourne – a high tech, energy efficient, state-of-the-art facility. Is sulphuric acid really the cause of delamination? Cal Stanley looks delamination and questions the popular wisdom that blames it on the use of sulphuric acid as a pH controller. 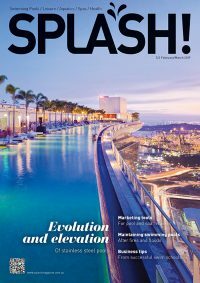 In the first of a series of interviews recorded at SPLASH! 2016, Carlos Del Amo talks about the post-GFC recovery, eco product marketing and South East Asia. Zodiac’s trade marketing manager Peter Kolomyjec has developed an in-store display that is helping consumers understand plant room components. Boss Solar is a small family owned and run business with plans to take on the world from their innovative Melbourne factory. Tintometer explains the importance of adhering to international standards for DPD reagents. To subscribe to the print edition click here.